What Now For Hungary's Orban And The EPP? With Hungary's ruling Fidesz party suspended from the main pan-European centre-right party until further notice, what now for Prime Minister Viktor Orban and what are the implications for the EU's most influential political grouping? On Wednesday a spokesperson for the European People's Party (EPP) said 190 party members voted in favour of the suspension of the Fidesz party from the bloc, with only three votes against, following reports of long and often heated discussions with Orban at a meeting in Brussels. Fidesz had faced expulsion from the EPP after running a controversial billboard campaign that accused European Commission President Jean-Claude Juncker and liberal US billionaire George Soros of plotting to flood Europe with migrants. 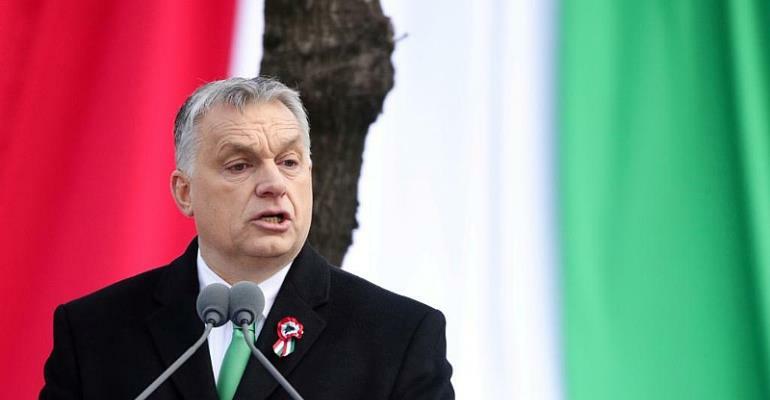 The campaign has since been dropped and Orban has apologised for insulting partners from the EPP – the mainstream conservative group of MEPs – though the party leadership had warned this was not enough. A statement said the suspension was a joint decision by Fidesz and the EPP in a last minute re-wording intended to stop Orban from slamming the door on the group forever. Sanctioning Orban has split the EPP, amid concern that the Hungarian leader will team up with Italian Deputy Prime Minister Matteo Salvini, leader of Italy's anti-immigrant Northern League, to create a rival group in the European Parliament. Faced with tough EU elections in May, some EPP members are also worried that punishing Orban will cost them support from anti-immigrant voters who back Orban's tough line. But others believe Orban crosses a dangerous line into xenophobia, anti-Semitism and racism that is not suitable for the EPP mainstream grouping. Speaking at a press conference after the EPP decision, Orban said it was "not possible to expel, or to suspend us, we have won four elections, so we decided to suspend ourselves unilaterally". The sanction against Orban has no end date, but party sources said senior party members would evaluate the situation and recommend next steps "probably in the autumn". "Exclusion is not off the table, it is on the table," said the EPP's Manfred Weber, who will be leading the party in the May vote. The EPP brings together the EU's main centre-right parties, such as German Chancellor Angela Merkel's CDU or the Republicans in France, the party of former French leaders Nicolas Sarkozy and Jacques Chirac. In an interview on Wednesday, Juncker, who won the EU's top office for the EPP in 2014, once again called for Fidesz to be excluded. "For years (Orban's party) has been moving away from Christian Democratic values," Juncker told German radio Deutschlandfunk. Therefore "his place is outside the EPP". Guy Verhofstadt, leader of the European parliament's liberal ALDE group said the compromise deal between the EPP and Fidesz, which avoided the Hungarian ruling party being kicked out altogether, was a "political ruse". "The EPP has lost the moral authority to lead Europe," Verhofstadt added. The European Parliament elections take place across the bloc from 23 - 26 May.